They say that lightening doesn’t strike the same place twice but apparently the Award of Excellence from the US Army and Pro Football Hall of Fame does. For the second year in a row Calvert High School was honored with another recipient of this very prestigious, national award. The U.S. Army-Pro Football Hall of Fame Award for Excellence, celebrates high school students who display excellence in academics, citizenship and athletics. The National Selection Committee evaluates nominees by their grade point averages, community service, athletic and school accolades, letters of recommendation and detailed essays written by each applicant. After this rigorous evaluation process, the committee chooses only 25 finalist. Of these 25 finalists, the final winner of this prestigious award will be announced on August 5, 2017, during the Pro Football Hall of Fame festivities in Canton, Ohio. 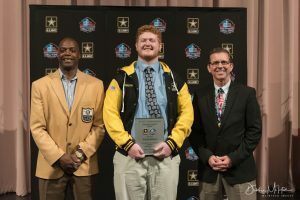 Once selected, each of the 25 honorees are honored at a special ceremony hosted by their high school, the Pro Football Hall of Fame and the United States Army. During the ceremony, a NFL Pro Football Hall of Famer and U.S. Army dignitaries present the honoree with a signed football and a United States Army-Pro Football Hall of Fame jacket. Along with these items, a plaque and the coveted invitation to attend the awards ceremony during the Hall of Fame weekend in August are awarded. This year marks the second year out of just five years since the awards inception that we have one of our own selected as one of the finalist. We are extremely proud to announce that junior, David Johnson has received a 2017 nomination and will join the ranks of those select few who have reached this same pinnacle of excellence, and forever have their names enshrined in the Pro Football Hall of Fame. David Johnson is a member of the Calvert Football program and track team. He performs admirably for both programs while holding a rigorous academic schedule featuring many AP and Engineering classes. He is a member of the National Honor Society and the National Technical Honor Society. David has earned a 3.75 unweighted GPA and has demonstrated true servant leadership through a verity of service learning opportunities. He has always participated in Calvert Football’s countless community events and even spends time each summer on mission trips in Appalachia through his local church. David has always been a pillar of excellence in our community and certainly has established himself as a young man to model our future student-athletes after. David’s ceremony and festivities at Calvert High School were held on May 24, 2017. Dandan Zou States of the Southern Maryland News, covered the ceremony and her accounts of the morning appear below. 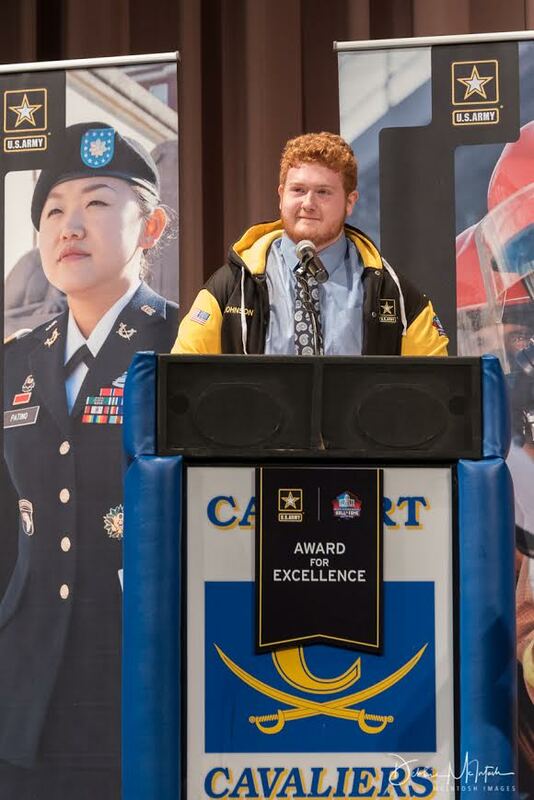 A Calvert High School junior was one of 25 finalists named for the U.S. Army-Pro Football Hall of Fame Award for Excellence. 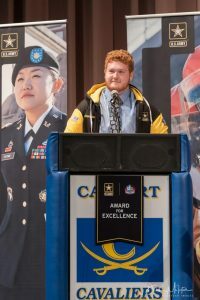 David Johnson, 17, is the third student in Calvert County to be named a finalist after Tyson Tran from Northern High School and Joey Osborne from Calvert High School in 2016. Johnson and Osborne are teammates and good friends. When Osborne was named a finalist last year, Johnson was sitting in the audience cheering for him. Now in its fifth year, the award program honors 25 high school student athletes across the nation who excel in academics, athletic achievement and community engagement, according to a press release. Johnson is one of 25 finalists selected from hundreds of applicants based on his good grades, athletic performance and community outreach efforts, said George Veras, executive vice president of the Pro Football Hall of Fame. In a 500-word essay all applicants are required to write, Johnson wrote about taking a week out of his break for two summers to go to West Virginia to participate in the Appalachian service project. During that time, Johnson built two handicap ramps for a family with disabilities and helped renovate a house for a young couple and their newborn baby to live in. Johnson’s attitude toward community service and volunteering is what the school’s football program tries to instill in students, according to his coach Rick Sneade who encouraged him to apply for the award. Johnson has played left offensive tackle on the high school’s football team for about three years while maintaining a GPA of 3.75. “He is respected by his teammates,” Sneade said, describing Johnson as a “leader” and a “quiet” student who always has a smile on his face. In the high school program, Sneade said the student athletes are expected to live beyond sports. It is more than going out to play football on Friday nights and scoring touchdowns, Sneade said. The school program tries to push students to become better citizens who live “selfless lives,” he said. 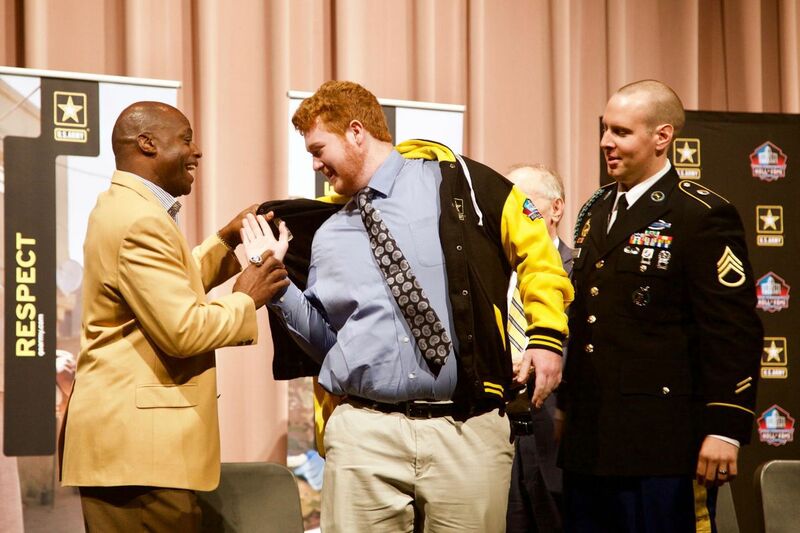 During the ceremony, Johnson received a jacket and a plaque from former Washington Redskins cornerback Darrell Green, also a Pro Football Hall of Famer. Green gave hundreds of students gathered together for the ceremony five tips on how to become successful. The first is to have a desire to be successful, he said. What follows is to decide what you want to do, focus, be realistic and go back and do it again if it doesn’t work. During his own speech, Johnson thanked those who helped him along the way, particularly his brother Tim. Johnson described his brother as “one of the nicest people” who always greets others with a smile and a handshake. Despite the bullying, Johnson said his brother managed to be a straight A student and an active member in the community. “I’m truly blessed to have you as a role model in my life, Tim,” Johnson said, receiving a loud applause. Wishing to follow in the footsteps of his brother Tim Johnson, who is an electrical engineer, David wants to become a mechanical engineer. He likes the hands-on and creative approach of engineering. Although he’s not pursuing a career in football, Johnson said being named an award finalist makes him feel he could achieve anything and strive for excellence regardless of the career path he chooses. The award winner is scheduled to be announced in August. Article written by Dandan Zou from the Southern Maryland News.